For us Indians any celebration or festival is incomplete without sweets. During festivals almost all the Indian kitchens have same scene~mother's and grandmother's standing for hours, sweating profusely but still making amazing sweets to feed all the greedy tummies. Jalebi is one sweet which was never made in my home, but on many weekends my dad used to treat us with the jalebi ,samosa and poha from the famous sweet shop in town. There was always a long queue in that shop..and the jalebi's used to vanish in no time. When I saw Srivalli's Indian Cooking Challenge this time, I was holidaying and could not take part, but the jalebi's were daily floating in my dreams :) So after returning I made these. 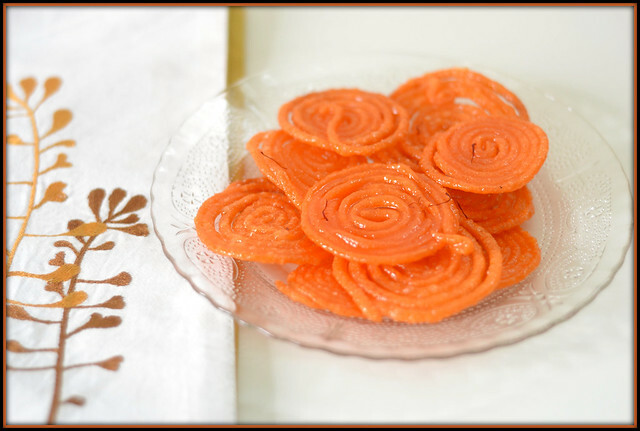 The process was very simple and the result was crisp finger licking good Jalebi's. In a bowl mix together all the ingredients of the batter. Whisk everything together so that there are no lumps. Set aside overnight for fermentation. Make Sugar syrup by mixing sugar and water and boil it till light syrup consistency is achieved. Add in saffron, cardamom powder and lime juice. Keep the syrup warm. In a squeezy ketchup bottle transfer the batter. Once the oil is hot squeeze the batter directly in the hot oil in the shape of spirals. Keep the temperature of the oil medium hot. Once the jalebis are fried , drop the hot jalebis in warm sugar syrup. Take out the jalebis in a minute out of the syrup. The oil should be medium hot. 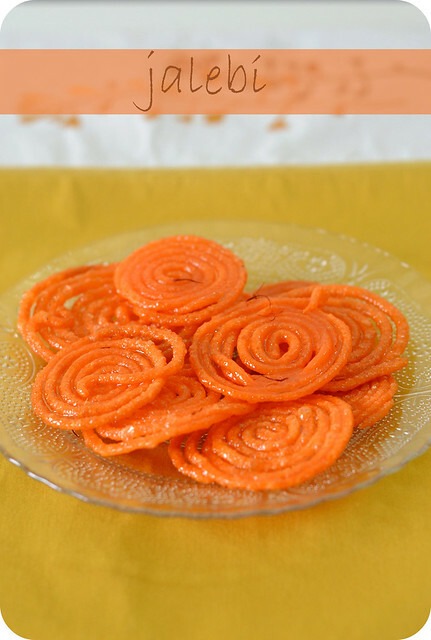 Make thin jalebis so that they stay crisp. Jalebis can be served with hot milk or rabri. Wow! Jalebis look awesome. Perfect shape, nice color and sounds delicious. I'm craving for these jalebis. What perfect looking delicacies! Your recipe has come out so well. Wow! those jalebis looks so yummy. Raji ..How do you make such perfect circles? Wonderful! Oh my...What perfect & crisp jalebis!!! My mouth`s watering!!! You have done justice to this lall time fav classic sweet dish!! jalebis look amazing, lovely clicks n presentation..
Omg, those jalebis looks super prefect and fabulous.. Welcome back Raji, nice to see your post after a long time. This surely looks delicious. Perfect! 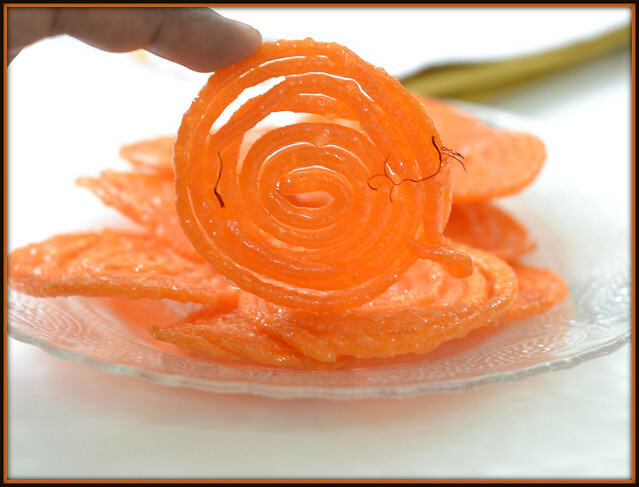 This is how a jalebi has to be :) Nice clicks as well! Looks crisp and you have got perfect swirls...Lovely. These are just amazing! I am sure they taste as equally delightful...gorgeous! Oh my .. the jilebi's are looking so inviting and tasty. Jalebi looks perfect.First time here. 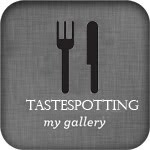 Following you,please do visit my space. Sounds wonderful.. I am so looking to find a perfect jalebi here..
Yummy jalebis (oh, they are my favourite!). I crave for them all the time...more because I am living far from my country! Now I can make them easily at home!! hi raji, first time to ur blog n blog looks very colourful...jalebi looks perfect n nice colour! im glad to follow u dear! wow nice nice .... looks easy..